You know it’s officially fall at Applecrest when you see our own apple cider in your box this week! Peaches are slowly seeing their end of the season, we’ve got more apple varieties coming in to look forward to and lots of root vegetables! Storing: The cider does not have to be refrigerated, it will last a couple weeks. Unpasturrized means that it is just pure apple juice, freshly pressed with a smidgen of potassium sorbate, an odorless, flavorless, colorless preserviate which is added only to extend the cider’s shelf life. The sweetness and shelflife of the apple cider will depend on the blended choice of apples and their sugar content that were pressed that day. The natural yeasts found in the cider will cause it to ferment over time. d’Avignon radishes are long with sprays of bright pink and white with long leafy greens. They are a variety of French breakfast radishes which makes them one of the most mild radishes. 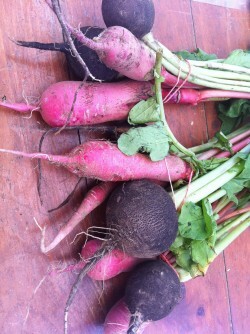 Nero Tondro radishes are round with a black skin. The flesh is bright white, crunchy, and spicy. Red Rover radishes are the most typical red radishes with the spice you’d want from a radish. They are part of the mustard family and the degree of hotness comes from how old the radish is – a longer length of growing time and/or if they are deprived or overwhelmed with weather conditions will make them hotter. They should be bright red with a translucent white flesh. Red rover red rover, send these radishes over! Storage: Twist off the greens. keep unwashed radishes in a plastic bag in the refrigerator. Only wash them as you use them as the radishes will absorb the water causing them to deteriorate quickly. Use within a week, two max. Medical: Radishes are low in calories and high in Vitamin C! They are known to relieve indigestion and flatulence. Cooking: Radishes should be firm. When ready to eat, wash radishes and scrub off any of the earth’s dirt in the crevices. The tops and roots should be cut off. Radishes can be eaten unpeeled, but apparently most of the kick is within the skins, so if they are too spicy, peel them. When cutting off the greens, leave about an inch to use as a “handle” or easy to grab top. Leave them in a bowl of ice water for about an hour for some extra crispness. Radishes are great eaten raw or slightly grilled with some butter and salt – a great pairing for their peppery kick! The leaves can be cooked like spinach. Radishes can be eaten whole, raw, shredded or sliced. Substitute radish for mustard in sandwiches. Melt butter in large pot over medium-high heat. Add onion; sauté until beginning to soften, about 5 minutes. Add cabbage; saute; until slightly wilted, tossing frequently, about 6 minutes. Stir in apple cider. Reduce heat to medium; cover and cook until cabbage is tender, stirring occasionally, about 6 minutes. Uncover; simmer until almost all liquid in pot evaporates, about 3 minutes. Stir in vinegar. Season with salt and pepper. Remove the tough outter green leaves of the cabbage. 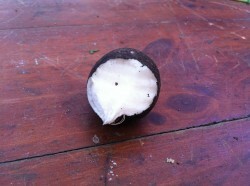 Remove the other leaves, stack them, roll up tightly like a cigar, then finely chop across into ribbons. Heat the oil in a large pan over high heat. Add the sliced cabbage and stir, cooking for about 4 minutes. Add the Worcestershire sauce and salt and pepper. Keep moving the cabbage around in the pan until it is nicely coated and cooked until it has softened, about 4 minutes. Remove from the pan and add some butter to give it a little sweetness. Serve alongside a meat dish, shepherd’s pie, or as a side dish to any fall-hearty comfort dish. Put the potatoes in a pot of cold water and bring to a boil, boil until tender, about 20 minutes. Drain the potatoes and let cool, cut in quarters. To make the dressing, in a large bowl, combine the extra virgin olive oil, sherry vinegar, mustard and salt and pepper to taste. Add the potatoes (while still warm and cool enough to handle, so they will absorb the most flavors from the dressing) with the celery and coat to dress. Let the salad come to room temperature before adding the radishes and their greens. Or….Try the salad with this Apple Cider Vinaigrette…. Boil cider in a small heavy saucepan until reduced to about 1/3 cup, 12 to 15 minutes. Whisk together reduced cider, shallots, vinegar, and mustard with 1/4 teaspoon each of salt and pepper. Add oil in a slow stream, whisking until combined. Put a large saucepan on a medium heat and pour in a couple of glugs of olive oil, add onion, celery, carrot, garlic, rosemary leaves, chile and a good pinch of salt and pepper. Cook gently for about 10 minutes until the vegetables are sweet and soft. Add the squash and the stock to the pan, bring to the boil and simmer for around 30 minutes.When the squash is soft and cooked through, whiz the soup with an immersion blender or pour it into a standard blender and pulse until you have a smooth puree* (but you can leave it slightly chunky if you like). Taste and season, drizzle with a swirl of good-quality extra-virgin olive oil. Preheat the oven to 400F. Place the beets in the center of a large sheet of tin foil witht he garlic and herbs, seasoned generously. Fold the sides of the tin foil into the middle to create a dish then add the vinegar and oil. Scrunch/fold the tin foil together to seal the top. Put on a baking sheet and plice in the oven and cook until tender, about 1 hour, depending on the size of the beets. Can be served straight out of the foil bag. A great side dish or chop up the beets/remove the garlic skins and top over grilled baguette slices and sprinkled with some parmigiano-reggiano for lovely appetizer or snack. Peel top third of each apple and rub peeled part with lemon half. Put apples in a wide 5-quart heavy pot and add cider and brown sugar. Bring to a boil, covered, over medium heat (this will take 25 to 30 minutes). Remove from heat and cool apples in cider, covered, about 1 hour. Stir together all ingredients with a pinch of salt, then spread on a small baking sheet into a 10-inch round. Bake, rotating sheet halfway through, until golden, 5 to 6 minutes. Transfer to a rack and loosen nuts, then cool (nuts will crisp as they cool). Beat cream with sugar, rum, and vanilla using an electric mixer until it just holds soft peaks. Drain apples, reserving poaching liquid for another use. Put an apple on each plate and sprinkle with candied walnuts. Dollop cream next to each apple and drizzle (bottled) boiled cider all over. •Apples can be poached 2 days ahead and chilled. Before serving, bring to room temperature. •Candied walnuts can be made 2 days ahead and kept in an airtight container. In a large saucepan boil the cider until it is reduced to about 1 1/2 cups and let it cool. In a large bowl with an electric mixer beat together the shortening and the sugar until the mixture is fluffy and beat in the eggs, 1 at a time. Into the bowl sift together the flour, the cloves, the cinnamon, the baking soda, and a pinch of salt, stir in the reduced cider, and combine the mixture well. Divide the batter among 18 paper-lined 1/2-cup muffin tins and bake the cupcakes in the middle of a preheated 375°F. oven for 25 minutes, or until a tester comes out clean. Transfer the cupcakes to a rack, let them cool in the tins, and remove them from the tins. Spread each cupcake with some of the icing.